Amazing cycle trip in the heart of the mystic Rodopi mountains - home of Orpheus. The Rodopi Mountains are situated in the oldest part of the Balkans and boast some of the loveliest coniferous woods in the country. The landscape is gentle and rounded, consisting of high ridges and deep river valleys with gorges intermingling with river basins and valleys. In contrast with our tour of the Balkan Mountains, this tour will take you even higher, to around 2,000 m, or 6561 ft. Most of the mileage is done on mountain roads, with relatively little traffic. Along them cyclists can see some old-style means of transportation: wooden carts pulled by horses, donkeys or cows. You may also meet some nomadic gypsies, picking mushrooms and berries in the woods, as well as some local Muslim inhabitants growing tobacco and potatoes, or herds of sheep or goats coming down from the mountain at the end of the day. Arrival to Sofia airport and transfer to the hotel. A pleasant descent along Trigradska River brings you to the village of Grohotno and the natural rock phenomenon "The Elephant". Then we continue upstream Shirokolushka River to the village of Shiroka Luka. We stop here to savour the spirit of this architectural reserve, famous for its preserved houses dating back from the Bulgarian Revival Period. We pass by the beautiful Smolyan lakes and finsh cycling in Smolyan town, where we stay overnight. Cycling from Smolyan to the historic place Rozhen. After a short rest you go uphill to a big picturesque meadow at 1700m which marks the beginning of a gentle downhill ride in direction to Laki town through “Momina voda” protected area. Nerby is the picturesque village of Borovo and the famous religious place with chapels and healing springs – Krastova Gora. Overnight in Borovo. Cycling specifics: distance: 39 km (24.2 miles); time: around 4 hrs; uphill cycling: 700 m (1,312 ft); downhill cycling: 1300 m (4265 ft). 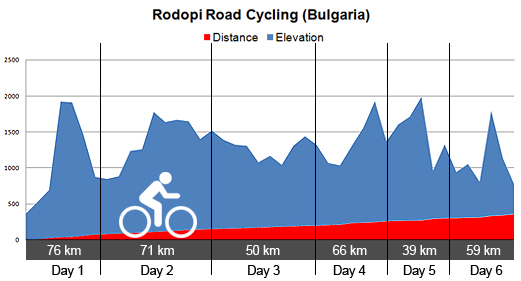 The downhill ride continues along Jugovska River valley to the main road Smolyan-Plovdiv. Short transfer brings you to the Miraculous bridges rock phenomenon for short walk and sightseeing. The next stop is Bachkovo Monastery (the second largest in Bulgaria). Transfer to Sofia for overnight. After breakfast you will be transferred to the airport for departure. ♦ Roads: we use mainly isolated village asphalt roads with little traffic, road conditions are relatively good with some exceptions (bumpy sections, potholes, rough asphalt), we do not go off road.The traffic might be a little bit heavier at some sections but only for a short while. Necessary equipment: We strongly recommend you wearing a helmet during the cycling. You can bring your own helmet or rent on of ours. Cycling gloves, breathable clothes, waterproof gear, cycling shoes/trainers. (for list with recommended items see “General” in the trip dossier). rent of bicycles - see above "Our bikes"
Moderate/Difficult. Tour for experienced bikers in good physical condition.